The Friends of Centurion Way Community Group Intend to Enhance and Preserve the Path for Everyone. The future of Centurion Way is uncertain. The southern end is at risk from a link road into the Whitehouse Farm development. Draft plans that the Developer has kindly shared with us show the path being routed down a long detour to make room for sports pitches on the west side of Centurion Way. A small diversion would be acceptable, but a major re-routing would not. We, the “Friends of Centurion Way” Community Group, are working to prevent the path from being downgraded, and to prevent any significant worsening of conditions for all current users. Whatever changes need to be made, the path must be the best it can be for everyone whatever your choice of transport – walking, scooting, cycling or mobility scooter – and whatever your journey, be it in or out of Chichester and to local shops like Tescos, or striking further out to Lavant, West Dean and the South Downs National Park. We worry that any re-routing will be longer and less attractive and therefore impractical for people with disabilities and people traveling with mobility scooters, pushchairs and small children, who currently enjoy an attractive, quiet and direct route in and out of the city. Without expert input, a poor design of Centurion Way could lead not only to a major diverting of the route, but also blind bends, insufficient width and thoughtless location of the path alongside the busy link road. In one version of the current plans on the Chichester District Council website, the detour does not even link back into Centurion Way. It takes you straight to a new roundabout at St Paul’s Road! There are other options! 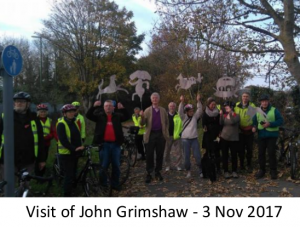 John Grimshaw, a recognised expert, who designed and negotiated the Centurion Way in the 1990s is helping formalise an alternative achievable plan with minimal diversion, which can enhance the area for the good of all users. This solution can provide the separate access Bishop Luffa seeks to the new playing fields and retains a reasonable routing for Centurion Way. Our plans secure continuing daily use of this wonderful route whether you walk, cycle, use a wheelchair, drive a mobility scooter, or push small children in a push chair. Next Steps: We will be taking our proposal to the Developers, Councils, Residents’ Associations, Chichester Society etc to seek a better solution for everyone. We are a West Sussex action group who want to protect a valued local asset Centurion Way. The group is formed from a diverse cross section of the community that use and enjoy the path.